As owner and founder of the trinket room, I feel blessed to be able to share my love for jewelry with all types of women from many different walks of life. I approach my own personal jewelry collection the same way that I select the collection that I create for the trinket room. It’s all about keeping things elegant and simple. I also believe in showing some personality by throwing in a unique flair when it comes to my jewelry. First up are these Gold Vintage Clip-On earrings. These are my absolute favorite earrings, I feel like I can wear these with anything and to anywhere. I love the shape and the the classy vintage look. When it comes to necklaces, there's always time for a fun and funky flair. A bold statement piece can go far when it comes to dressing up a simple outfit. 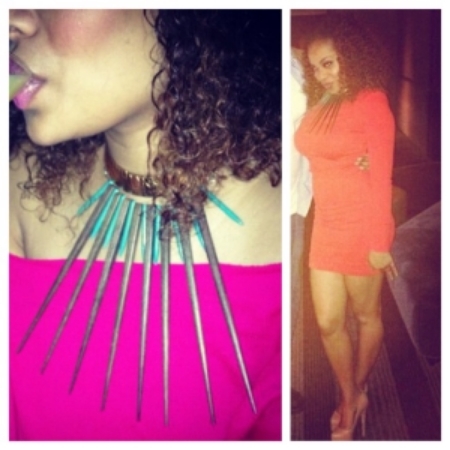 This spikey choker necklace is so over the top that you have to wear something simple to make it really pop. I didn't realize how much I really enjoyed wearing this necklace. I was actually going to get rid of it. I'm so glad that I didn't because it has served me well. This piece gives me that big bold look that I like. This double herring bone necklace is one of my favorites. I would actually go as far to say that I loooovvvee this necklace. I have to admit that I wear this necklace with everything. I love these earrings for their shape and simplicity. They have a vintage look and feel to them. Gold right now is my thing so I absolutely love these!!!! Posted on January 17, 2015 by Jae' Semone. I recently sat down with Social Media maven and blogger Shantha Wetterhan, for a fashion article. She saw my extensive shoe collection on Instagram and asked me to sit down for a quick Q&A to talk about one of my most fav subjects....shoes! 1. When did your love for shoes begin? I think my love for shoes started around middle school, at that time I loved sneakers and I probably owned every sneakers you can think of. Once I got to college it was unbearable. I was known as “the girl with the crazy shoes game.” And it’s like that even now. 2. Do you remember the first time that you purchased high end shoes? My first purchase was in college. I was in Nieman Marcus shopping with my parents. I purchased my very first Giuseppe Zanotti strappy wedges. I use to lovvvvveeee them!!!! I probably wore them with everything. 3. What do you like for in a great shoe? I like shoes to have a unique look and/or great quality. You can tell when shoes are cheap looking and poor quality. 4. Do you ever sacrifice comfort for style? Sometimes. As I get older, I can’t handle it like I use too. So I have rules, if I am dancing all night, I will go for more comfort. If I am attending a nicer event, and requires being more dressy and sitting more, I would sacrifice the comfort. 5. Any advice for women who want to start expanding their shoe selection? My advice to women, who want to start expanding their shoe selection, is spending the money on classic shoes like pumps in basic colors. They will never go out of style. For the trendier styles, I would say look for sales, get a good deal. Whatever you do don’t buy cheap quality shoes, they hurt your feet and will break/tear apart after wearing few times. Which to me is a wasted of time. 6. How do shoes and jewelry tie in together? Shoes and jewelry are considered accessories. You can have on something plain like all black and can dress it up or down by your accessories. Depending on your shoes and jewelry you can definitely make this outfit pop or not. So shoes and jewelry are always tied together and is very important to your outfit. Posted on December 8, 2014 by Jae' Semone and tagged fashion shoes accessories jewelry style. FASHIONISTAS AND DESIGNERS ALIKE ARE SHYING AWAY FROM THE MOSTLY NEUTRAL AND DARK SHADES THAT TOOK OVER LAST WINTER’S FASHION LANDSCAPE. THE NEWEST STYLE TRENDS ARE BRINGING REALLY BRIGHT COLORS TO THE FOREFRONT. THIS MEANS THAT BOLD AND INTENSE COLORS ARE NOW IN. YOU WILL BE SEEING MORE PERSONALITY IN THE FASHION COLOR PALETTE AND STRONG BURSTS OF A VARIETY OF COLORS. YOU WILL NOTICE THAT EVEN THE COLOR BLACK HAS HINTS OF OTHER EYE CATCHING COLORS THIS SEASON. BLUE – THE COLOR BLUE HAS ALWAYS BEEN A POPULAR COLOR IN FASHION. ITS TRANQUIL HUES SPEAK PEACE AND STILLNESS. TO KEEP IN LINE WITH THE FASHION TREND OF BRIGHT COLORS, IT’S BEST TO PAIR BLUES WITH CONTRASTING SHADES OF THE SAME COLOR OR WHITE. DON’T BE AFRAID TO PAIR TWO BLUES FROM THE SAME COLOR FAMILY YOU CAN ALSO PUT ON A BRIGHT BLUE BELT WITH AN INTENSE COLOR FOR A STYLISH FLAIR. Purple –is the color of royalty. Fashion mavens who wear this color, give an air of luxury, sophistication and wealth. Purple also help its wearers send the message of femininity and romance. Yellow – This cheerful and attention grabbing color is considered to be an optimistic hue. When wearing this color, keep in mind that this color can be more over powering for people to take in. It’s best to wear one yellow item or leave it to the accessories. The rest of your outfit should be a neutral color. None of us want to look like clowns when we step into the next board meeting. Red – This color has always been seen as a color that sparks intense emotions. This is also a color of love. Women who are seeking the attention of a current or prospective suitor should wear red. A great way to work red into your wardrobe is to layer your look by wearing a blazer over a colored shirt or sweater. Although many people choose to stick with the black, white and grays because these colors are a part of their wardrobe comfort zones, it can be rewarding to step out and try new colors. You will find that it is easy to build outfits around brighter colors while incorporating neutral colors. Just follow these simple style types and you are on your way to being a style trendsetter. Posted on November 24, 2014 by Jae' Semone. Winter 2014 IS Almost HERE! AS A DESIGNER AND OWNER OF MY OWN JEWELRY BOUTIQUE, THE TRINKET ROOM, IT IS VITAL FOR ME TO KEEP TRACK OF CURRENT AND FUTURE TRENDS. FALL 2014 WILL BRING BIG CHANGES TO FASHION, AND I AM SO EXCITED ABOUT WHAT IS TO COME. THIS YEAR IT WILL BE ALL ABOUT BIG AND BOLD PIECES, WHILE MAINTAINING ELEGANCE AND SIMPLICITY. IT’S ALL ABOUT BALANCE. STATEMENT PIECES WILL BE YOUR SECRET WEAPON TO A CLASSY OUTFIT. THE BEST PART WILL BE THE VERSATILITY OF THESE PIECES. PAIR THEM WITH AN ELEGANT DRESS FOR EVENING OR JEANS AND A T-SHIRT WHEN HAVING LUNCH WITH FRIENDS. YOU DECIDE WHEN AND HOW TO ROCK THESE CLASSY NEW ACCESSORIES. 1. FRINGED BRACELETS: THIS YEAR AT THE CHLOE FALL/WINTER 2014 FASHION SHOW, FRINGED BRACELETS WERE EVERYWHERE ON THE RUNWAY AND OFF. ACCORDING TO VOGUE PARIS, “BRIGHT, FLUID GOLD THREADS CUFFS SWAYED TO THE RHYTHM AS THE GIRLS WALKED THE CATWALK.” THIS WILL BE THE PERFECT PIECE TO JAZZ UP ANY SIMPLE OUTFIT, AND THEY’RE APPROPRIATE FOR NIGHT OR DAY. 2. 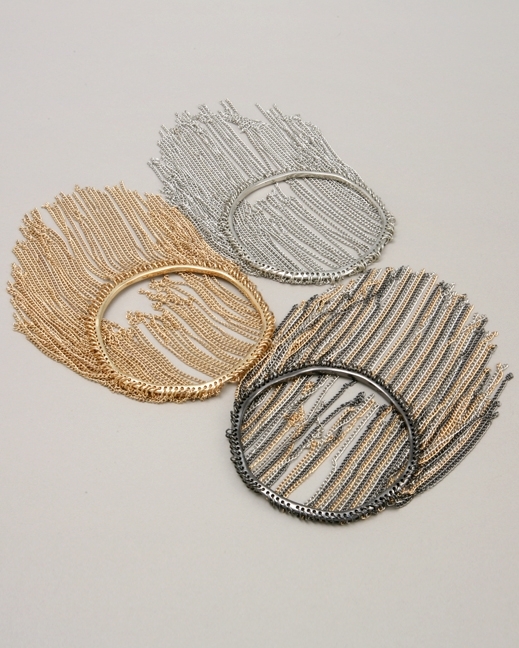 CREOLE HOOPS: ANOTHER RECOMMENDED MUST-HAVE FROM VOGUE ARE THE CREOLE HOOPS. BAMBOO-STYLE OVERSIZED GOLD CREOLE HOOPS WERE ALL OVER THE RUNWAY, AND I THINK THEY’LL BE A BIG HIT THIS FALL. PAIR THEM WITH A SIMPLE BLACK DRESS OR JEANS AND A T-SHIRT FOR TWO FRESH, NEW STYLES FOR FALL. 3. THE BUCKET BAG: EVERY CLASSY WOMAN NEEDS A NEW BAG ON HER ARM THIS FALL, AND THE BUCKET BAG IS THE PERFECT FIT. THE BUCKET BAG IS LONG AND SLIGHTLY ROUNDED ON THE END WITH ELEGANT TIES AT THE TOP TO SYNCH TOGETHER. BELIEVE IT OR NOT, IT’S BEEN HERE ALL SUMMER, AND ACCORDING TO THE ZOE REPORT, IT’S NOT GOING ANYWHERE FOR FALL! 4. 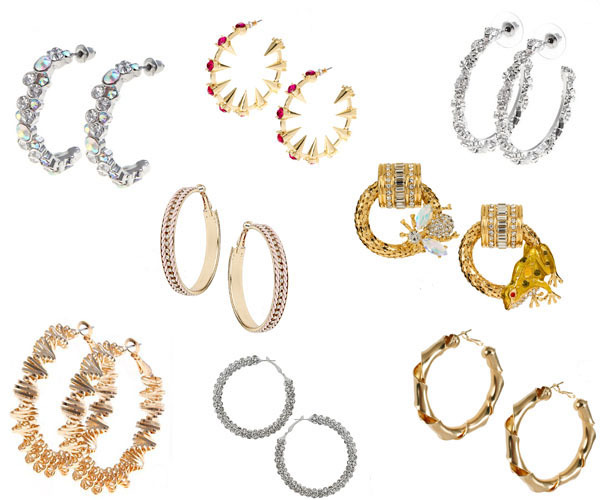 STATEMENT RINGS: THIS IS ANOTHER TREND THAT WE’VE SEEN BEFORE, BUT ACCORDING TO GLAMOUR MAGAZINE, IT’S STILL HERE! A CLASSY STATEMENT RING IS AN EASY WAY TO SPICE UP YOUR OUTFIT, AND GET NOTICED ANYWHERE. GO WITH A CHUNKY RING THIS FALL, WITH METALWORK AND GEOMETRIC SHAPES TO MAKE AN OUTFIT REALLY COME TOGETHER. 5. COLLAR NECKLACE: THIS IS A BEAUTIFUL NEW TRENDY PIECE THAT CAN CHANGE YOUR ENTIRE LOOK. 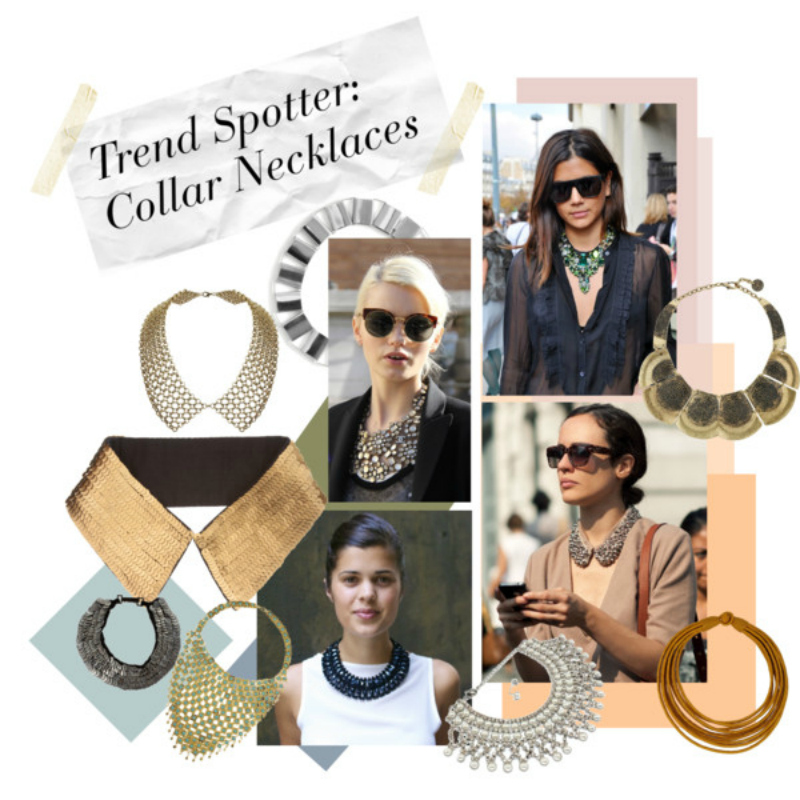 ACCORDING TO SHE FINDS, “COLLAR NECKLACES ARE NOT ONLY THE KEY TO VAMPING UP A BORING, TIRED JEANS-AND-TEE OUTFIT, BUT THEY’RE THE BREAD AND BUTTER OF ALL STREET STYLE MAVENS,” WHICH MEANS THIS PIECE WILL BE VITAL FOR YOUR CLOSET THIS FALL. DESPITE THE NEW WAVE OF EXCITING TRENDS THIS YEAR, STAY TRUE TO WHO YOU ARE AND WHAT YOU LOVE. DON’T LET CHANGING STYLES DISCOURAGE YOU FROM FINDING YOUR OWN PERSONAL FALL TRENDS, BUT DON’T BE AFRAID TO TRY SOMETHING DIFFERENT THIS YEAR! REMEMBER: IT’S ALL ABOUT THE BALANCE. KEEP IT SIMPLE AND ELEGANT, AND YOU CAN NEVER GO WRONG! Posted on November 1, 2014 by Jae' Semone. As a jewelry designer and owner of The Trinket Room, many women come to me for advice on how to use jewelry in order to pull together the right look. I can certainly understand this fashion dilemma. Every day women are tasked with making the choice of whether or not to wear a bold necklace without earrings or choosing to pair a chunky bracelet with a ring on the same hand. The beauty of having a range of different types of jewelry in your personal collection is having a limitless number of possibilities when it comes to wearing it. Despite all of these choices, I believe that jewelry should be worn with the main goal making a statement. This can be done through elegance and simplicity. I have identified 5 ways that can help you ensure that you are wearing the right amount and types of jewelry. These tips will keep you stylish, tasteful and elegant. 1. Balance – It’s important to spread out your accessories in order to achieve a balanced look. If you wear a large necklace, keep the earrings to a minimal. If you wear large earrings, try not to wear a necklace at all. The best thing to do is to look at your jewelry while standing in a full length mirror. You want to make sure that your pieces are not competing with each other. 2. Follow the Sales – Stock up on accessories when you find sales. This really works at the beginning of each season. You can mix expensive jewelry with less expensive items. The more jewelry that you have, the more options you have. 3. Stay Organized – The best way to stay inspired to wear your pieces is to make sure that they are hanging on hooks or jewelry hangers and on display for you to see. It can also be helpful to organize each piece by color. 4. Focus on the Earrings – If you are wearing a statement necklace, you don’t want your earrings to cause a distraction. Small studs are certainly better to pair with a larger necklace. The main goal is for them to compliment, they don’t have to match perfectly. 5. Rings and Bracelets – Try making a bold statement by wearing several bracelets on one arm. But, forgo the necklace and balance the bulk out with large earrings. A woman’s accessories should display her personality. So, it’s important to explore and see how your jewelry can represent who you are as an individual. Even if you choose a very simple piece or minimal jewelry, your confidence, personal style and elegance will shine through. Posted on September 6, 2014 by Jae' Semone. 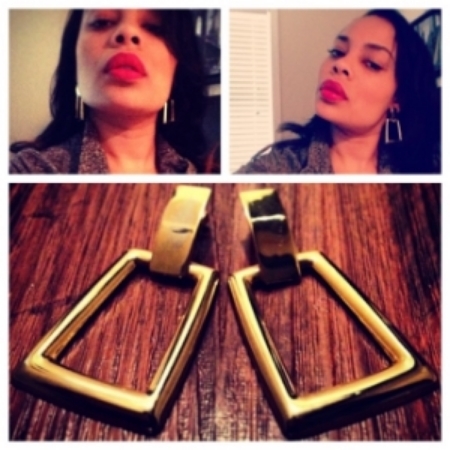 Atlanta based Jewelry designer Jae Semone has an eye for beauty, love for fashion and respect for elegant charm. Semone has been able to bring her passions together and into the online market through her boutique, the trinket room. The store specializes in beautiful and unique jewelry for woman. Originally from Miami, FL, Semone relocated to Atlanta in order to attend Clark Atlanta University. “I love Atlanta because I feel like the city is where I truly grew up and became a woman. I learned a lot of responsibility while living here.” She said. Today, Semone is fortunate enough to be doing what she loves. “I have always had a love for not only jewelry, but also for fashion. Jewelry is a huge part of fashion.” She said. Semone designs many of the pieces found on her website. She is constantly learning new things about her craft. “I enjoy keeping up with the industry and that is why I take classes on jewelry making.” She said. Semone believes that what sets the trinket room apart is her ‘less is more approach’ to accessorizing. “I believe that powerful statements can be made through simplicity and elegance. I love to have a plain outfit on and then be able to dress it up with a nice piece of jewelry.” She said. Semone is able to do this in a seemingly effortless way. From her onyx inspired rose-shaped ring, to her collection of intricately designed bracelets, her jewelry embodies a bold beauty and subtle charm that every woman can embrace. Posted on August 1, 2014 by Jae' Semone.